The English expression “How many angels can dance on the head of a pin?” originates from a myth about the fall of the city of Costantinople in 1453 E.V. While the army of Muhamed II was about to conquer the city and to put an end to the Eastern Roman Empire, the Byzantine theologians were busy arguing around formal minutiae, completeley unaware of the gravity of their situation. During the first 10 days of December 2015, 195 countries joined in Paris to discuss how to reduce the greenhouse effects driving global warming. The question is: is it necessary ‘to discuss’? Is the global warming a fact or an hypothesis? J. Scott Armstrong is a professor of Marketing at the University of Pennsylvania, and he is the author of ‘Principles of Forecasting‘, a cornerstone for anybody studying, ehr, forecasting methods. This preamble aims to explain that Armstrong is not the ultimate schmuck in the field of forecasting. In 2007 Armstrong challenged Al Gore to a bet about global climate warming: Al Gore is in the front line (together with IPCC, the United Nations’ International Panel on Climate Change) supporting the idea that the temperature would be constantly raising, and it’s something perceivable yet in few decades. Armstrong, on the contrary, asserts that the temperatures would remain at early 2000s’ level. September 2015: what’s the result? The 93 months of the 120 month (10-year) Climate Bet so far has witnessed 45 months in which the global average temperature anomaly increased from the previous month, and 46 months in which the global temperature fell. This pattern, or lack of it, is of course consistent with the Green, Armstrong, and Soon (2009) evidence-based no-change forecast that is the basis of Professor Armstrong’s notional bet with Al Gore. What’s the point of Armstrong’s bet? First, Armstrong contends that agreement among forecasters is not related to accuracy – and may reflect bias as much as anything else. “You don’t vote“, Armstrong told me. “That’s not the way science progresses“. Remember this last sentence. We will discuss about this again later. Next, they say the complexity of the global warming problem makes forecasting a fool’s errand. “There’s been no case in history where we’ve had a complex thing with lots of variables and lots of uncertainity, where people have been able to make econometric models or any complex models work”, Armstrong told me. “The more complex you make the model the worse the forecast gets“. Finally, Armstrong and Green write that the forecasts do not adequately account for the uncertainity intrinsic to the global warming problem. In other words, they are potentially overconfident. Ok, so Armstrong seems to propose a sense of skepticism about the Climate Warming. But I believe that probably his words need to be accurately weighted. Armstrong is too much an old fox to affirm that global warming is not a fact. Armstrong bets that during the 2000s (and only 15 years have passed) the temperature is not raising, but he has never stated that the temperature hasn’t risen in the last centuries, or at least just in the XXth century. Now focus on the left black line that shows the 20th century temperatures record. 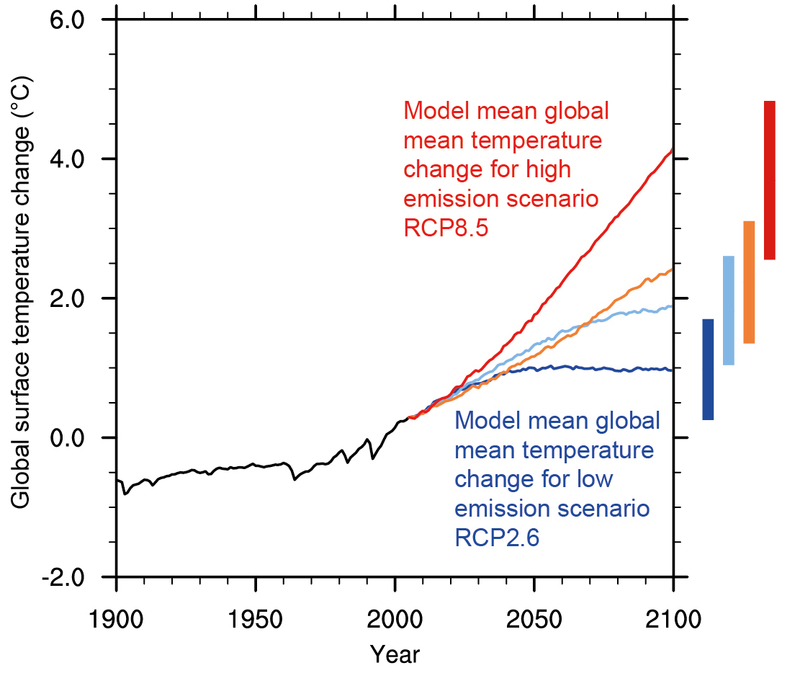 (If you want to go deep into the meaning of the coloured lines and bars about the 21st century, see the original IPCC report where I stole this image). Only Ray Charles or a very biased mind would not agree that during the second half of the 20th century the global temperature has risen of about 1°C. Well, what could have caused this global temperature’s perceivable increment? 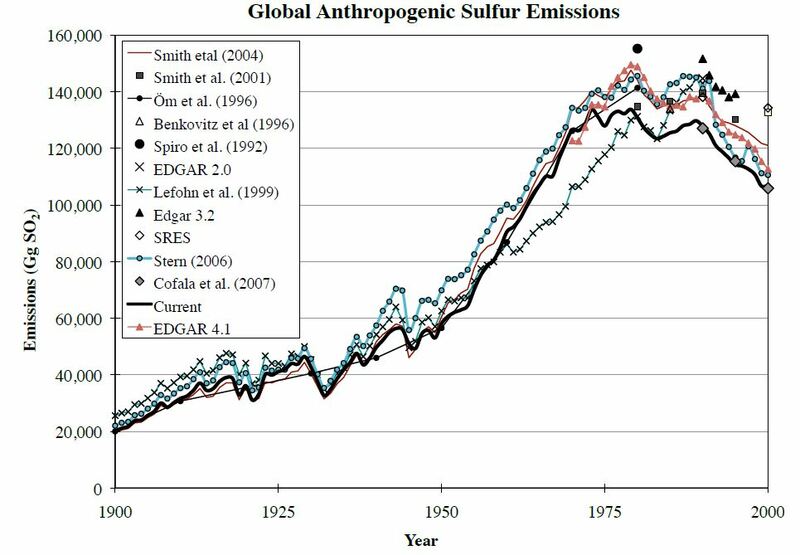 All the models seem to agree that a peak has been reached in sulfur emissions caused by human industrial activity in the late 20th century. So, has Armstrong completely gone nuts or does he seriously believe that the global warming is not a fact? I believe Armstrong’s bet is actually a provocation. The problem is that the time horizon of climate changes in the past was eras, or hundreds of years. Now we are witnessing a change in the scale of years. What Armstrong has really done is called interpolation. He has never talked about projections or models. The difference between an interpolative curve and a predictive curve is that the interpolative one will have zero standard deviation and high variance with training data, because this curve will fit them all as much accurately as it can. The interpolative curve does not care a damn thing about new data, it is all about the training set. In other words, Armstrong’s bet is overfitted. Why does he seem to be right? Because only a decade has passed. The more new data about global temperature will be gathered, the more Armstrong will lose his bet – unless we won’t start to modify seriously the causes of global warming. But Armstrong’s bet is also very witty for me. His bet is teaching us that as long as we give rise to something so misleading, we are legitimizing everyone to tell his opinion. Even people telling that the global warming is caused by cows’ flatulence. The debate about global warming is between two factions, composed by 98% of scientists stating that global warming is a fact and about 2% of scientists stating the contrary. We are under siege of climate change and we are wasting time listening to the 2% of lunatics of the scientists’ population. Does it seem sensible or do you feel a little Byzantine aftertaste in it? Remember Armstrong’s words: Science does not progress democratically. There’s no room for everyone to tell his opinion, because not every opinion has the same weight. Many scientists and climatologists agree that to stop the climate change is more about politics than about policies. As long as we have to mediate between countries’ desiderata, fearing to disappoint someone, letting the future of human society being relegated in the background, I don’t think it is possible to put it on a scientific level. If there’s only one chance to fight them, sadly it’s with their weapon: the profit. Government by nature will never listen to you because it is right (or because they’re basically firing their own foot) but only in case ‘An Inconvenient Truth‘ would become convenient. And, believe it or not, our future might depend on insurance companies. Munich Re‘s core business is risk management since 1880. They started to show interest in global warming in 1974, when they recorded a strong increase in natural disasters all around the world. So, they decided to found the Corporate Climate Center (CCI). Currently CCI’s director is a meteorologist, Peter Hoeppe, and together with his équipe, they have come to the conclusion that in few decades it will be impossible for them to predict serious weather conditions. The final result for Munich Re is that it will be pointless to take out insurance policies. The most important point to remember is that COP21 ought to conclude with an active engagement between governments, policymakers and the scientific community. Otherwise, in the future there will be no angels to pin on about climate disasters, but only our eve’s indolence.